This is a mix of Dragon (Deep version) and Lattice evolution. Like Dragon (Deep version) it's a 4-armed dragon (if that makes any sense) and like Lattice evolution it's a completely connected tiling. That's unlike 3rd Order Evolution Of Tilings, for example, which is a collection of separated tilings. The new idea here is to make a 4-armed dragon from a 4-fold rotational symmetric tiling and fill it with more 4-fold rotational symmetric tilings. Because of that there are 4-fold rotational symmetric elements all over the place. In theory the same can be done with 8 but that's far deeper than what can be achieved. Unliked Dragon (Deep version) the dragon here is not as complex. More morphings would have turned some of the 4-fold points into 8-fold, breaking the pattern. Usually the patterns that I make are finite approximations of an ideal that requires infinitely many (repetitons of the same sequence of) morphings, but not this time. This is amazing! May I ask how you pick your colour palettes? I design gradients in photoshop. 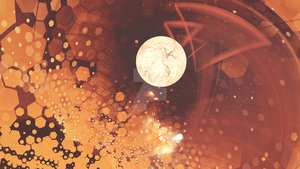 When I still used fractal extreme I used the built-in gradient design tool. Now I use photoshop to make gradients, which are then just images at a resolution of 4096×10 (but could be any resolution). In mandel machine and kalles fraktaler you can use images as a gradient. It's annoying because making a change to the gradient in photoshop requires saving it and loading it in the fractal program to see the result. Usually I don't start with nothing though. I have a collection of gradients that I often edit to make new ones. Using many filters on top of each other can cause noticeable distortions in the colors that I think are due to rounding errors. When needed I "fix" the problem by applying gaussian blur to the whole image, making the gradient smooth again. Alright, thanks for replying this quickly. Sounds like a great way to develop palettes.